This Dagger should be in the Tower of London with the other Crown Jewels! Hale makes Daggers like no other knife artisan. His complexity of design is unmatched. This huge dagger weighs almost 2 pounds. Fileworked furnishings of 440C. The handle is compounded of Sterling Silver, Abalone inlay, and filed Steel all on a rich bed of black ebony. Knockout double hollow ground blade. Hale has a collection of three-hundred of his knives that permanently reside in the Louisville Museum. This man is the master, with more knives in a Museum than any knifemaker that has ever lived. The largest Museum display of any custom knifemaker in the world is that of Lloyd Hale. This dagger demonstrates Lloydâ€™s ability for file work and knifemaking. The more one studies it, the various designs pop out at you, like the crown shaped pommel, and the extensive file-work of great complexity throughout. 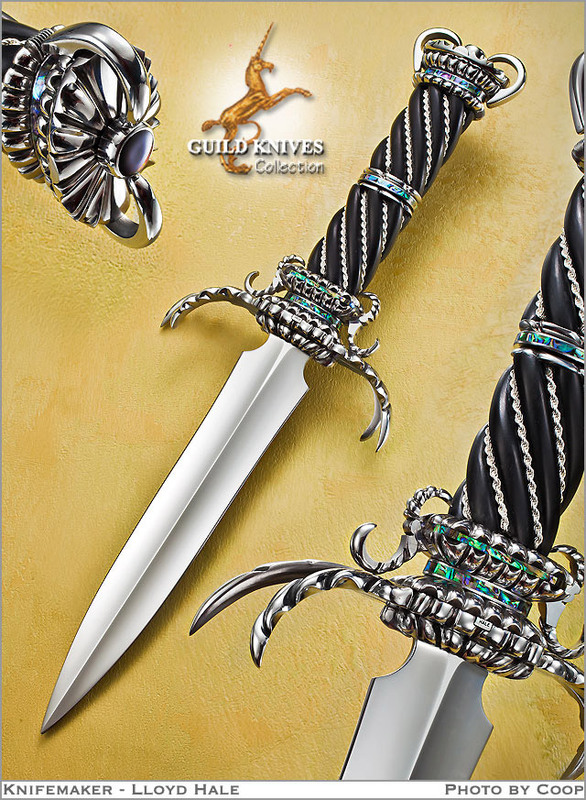 This is an Heirloom dagger for Royalty! Handle Material: Sterling Silver on fluted ebony, abalone. Bolster/Guard: 440 C extensively fileworked and inlayed.